Died: 1st June 1917; age 35; KiA. Date of Entry Therein: 16th December 1915 – France. 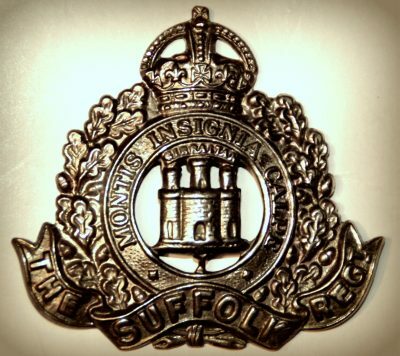 Regiment: Suffolk Regiment, 8th Battalion. Medals Awarded: Victory , British War & 1914-1915 Star. 1891 Porter’s Cottage, Grey Frairs Road, Ipswich. Richard was 8 years old and living with his parents & siblings. Richard Burwood, 37, a Cooper, born Ipswich. Emily Burwood (nee Sewell), 37, born Leiston, Suffolk. Louisa Emily Burwood, 14, a Nurse Girl, born Ipswich. Clara Elizabeth Burwood, 12, born Ipswich. William Arthur Burwood, 5, born Ipswich. 1901 in Court, Crown Street, Ipswich. Richard was 18 years old, a General Labourer. He was living parents & siblings. Richard, 48, a Brewer’s Cooper. Clara, 22, a Factory Hand – Paper Box Factory. William, 15, a General Labourer. Lily May Burwood, 7, born Ipswich. 1911 6, Church Street, Ipswich. Richard was 28 years old, a Coal Carter. He was living with his mother, sister & maternal uncle. Lily, 16, worker at a Jam Factory. Arthur Sewell, 55, a House Painter, born Leiston. Soldiers’ Effects to Emily Burwood – mother.